Have you realized that your “proven” sales techniques are not working, or at least they could use a little help? 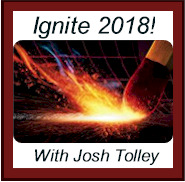 Now is the time to look ahead and IGNITE your new or existing business plans for 2018. Get a FREE two-hour taste of what most people running businesses don’t know about business and what retail store operators need to hear. Is Amazon cutting into your retail sales? Do you need to find and train the best employees? Are you trying to start a business? Addressing these key factors alone will improve your success! Popular with MBAs and business professors as well as mom-and-pop startups, what you learn for free will change what you thought you knew about business forever. Josh Tolley will be giving a pro-bono seminar in Salem, OR. worth thousands of dollars, however, Josh not only wants to give back to the community by empowering businessmen and women, but he also wants to include real people in his next best seller, “Stop Selling – Start Selling”… and YOU might be one of them! Bring your questions and problems for world-class advice and follow-up. RSVP because space is limited, but if your business needs to improve from the slightest to the most, this class will help you thrive now and moving into 2018. Ask anyone who’s been to a seminar why Josh’s material is like no other sales training you’ve had, hands down!